Marigolds have been a garden staple for decades. If you need a shorter variety, French marigolds (Tagetes patula) are not as upright as the African types (Tagetes erecta) and are very aromatic. They will brighten up any garden with their bright yellow, orange and red shades. Read on to learn more about the planting and care of French marigolds. French marigolds can be easily grown from seed or purchased as bedding plants. As with most bedding plants, there are a few factors to take into consideration when you are thinking of how to plant French marigolds. 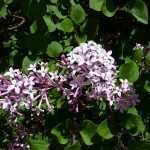 These plants require full sun and well-drained soil. They also thrive in pots, and a pot of marigolds here and there will add a splash of color to your landscape. These marigolds should be planted deeper than their bedding container. They should also be planted about 6 to 9 inches apart. After planting, water thoroughly. This is a great plant to start from seed. Planting French marigold seeds can be done by starting them in the house before 4 to 6 weeks before winter has passed or by direct seeding once all danger of frost has passed. If you are planting French marigold seeds indoors, they need a warm area. Seeds need a temperature of 70 to 75 degrees F. (21-23 C.) to germinate. Once the seeds are planted, it takes 7 to 14 days for the plant to pop up. 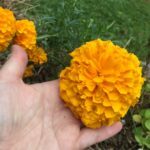 Looking for facts about French marigolds? 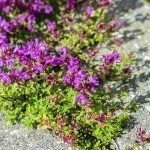 These plants are small, bushy annuals with flowers up to two inches across. They come in a myriad of colors, from yellow to orange to mahogany red. Heights range from 6 to 18 inches. These delightful flowers will bloom from early spring to frost. While growing French marigolds is easy enough, the care of French marigolds is even simpler. Once established, these flowers need little care other than watering when it’s quite warm or dry – though container grown plants require more watering. Deadheading the spent blooms will also keep the plants tidier and encourage more flowering. French marigolds have very few pest or disease problems. In addition, these plants are deer resistant, will not take over your garden and make wonderful cut flowers.